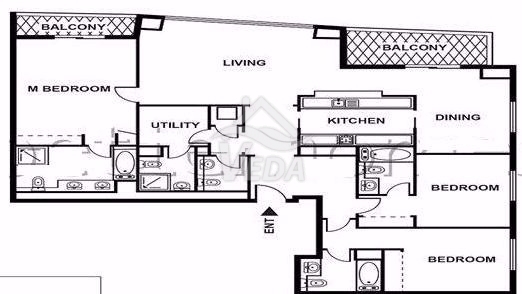 Breath taking 3BR+M in the heart of Dubai! Described as The Centre of Now, Downtown Dubai is the flagship mega-development by Emaar Properties. Located at its centre is Burj Khalifa, the worlds tallest building. The Dubai Mall, the worlds largest shopping and entertainment destination, and The Dubai Fountain, the worlds tallest performing fountain, add to developments list of must see attractions whileSouk Al Bahar, an Arabesque shopping and dining out destination, further broadens its appeal to visitors. The Opera District, highlighted by the majestic Dubai Opera, a 2,000-seat multi-format events venue, luxury hotels and residences, is a brand-new addition. Downtown Dubai is a thriving city hub with a unique mix of aesthetically designed residential towers and commercial precincts. Mohammed Bin Rashid Boulevard, the vibrant thoroughfare dotted with cafes and retail outlets, also hosts colourful events that bring the community together. A centre for tourism, Downtown Dubai has several world-class hotels including the worlds first Armani Hotel and Emaars flagship Address, Vida and Manzil hotels. The spectacular New Years Eve Gala, held at the heart of Downtown Dubai, is today among the worlds most-anticipated events. Company Profile: Veda Real Estate is a dynamic property brokerage and advisory firm based in Dubai. Our long-term vision is to become a leader in the Dubai real estate industry, through setting higher standards in the quality of marketing, customer care and professional services offered.At Veda we are passionate about getting to know our clients, so we can present them with bespoke opportunities and a long lasting after sales service, catering to their every need.Veda uses internationally recognized conveyancing processes, based on a proper legal framework that protects all parties. Before we represent any property, we undertake rigorous due diligence.Property owners and investors approve of our property valuations as they are backed by quality market research and data analysis.If you have a query, require some analysis or simply want a chat, Vedas property consultants are at your beckon call. We strive to achieve long lasting relationships that dont end after the transfer is done. Is this the end of the Gulf’s Indian cash dash?